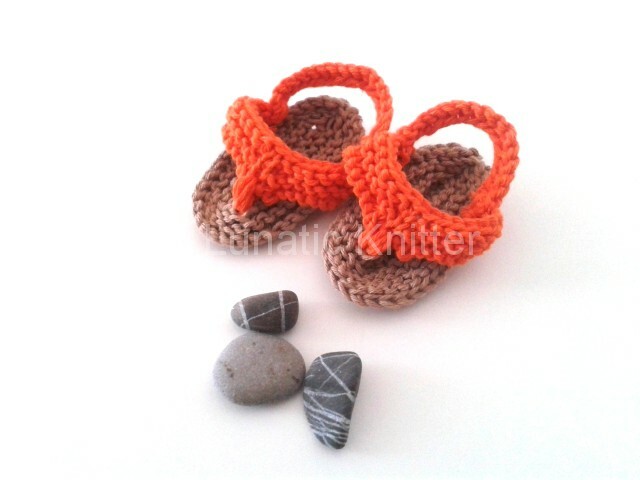 I would like to present you my new creation: the knit pattern for the orange flip flops! I made different prototypes and I finally came up with this. I like it because the sole is perfectly flat and oval. When crocheting it is simple to give this oval shape but when knitting it seems more difficult. I am satisfied with the result. The toe part is triangular and I made it in orange, the color of summer par excellence. This entry was posted in knitting and tagged flip flops, knit pattern, knit sandals, thongs on July 23, 2014 by Claudia.